Gone are the days When Night vision devices were only within the reach of the military, security services and the very wealthy. Now that Night Vision technology has been exploited for consumer use, a range of very affordable units are now available. Night vision devices, through the use of opto-electronic technology allow observation in low light conditions by the amplification of ambient light provided by the moon and stars, or faint artificial lighting. The user sees a magnified and intensified image of objects undetectable to the naked eye. 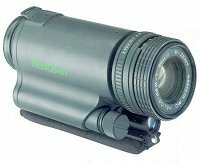 Night Vision scopes are typically used for nocturnal wildlife observation, hunting, fishing, shipping and navigation, farming, home security, search and rescue, tourism and police applications. We have great pleasure to offer three high quality units to welcome you to the miraculous World of Night vision. Replaces the standard 37mm f1.0 lens on the tracker and pioneer converting them to 2.7x or 3.8x magnification monocular respectively. A combined kit of the 29011Tabletop Tripod and adaptor to convert it into a Car Window Mount. Supplied complete with an arm support strap that can be used in conjunction with the tripod to give extra support when used with high magnification scopes and binoculars. Supplied with a pouch case. Latest addition to the range is the Atlantis 1113 monocular, waterproof....and it floats!! Ideal for marine use or outdoor work in extreme conditions. A high power IR illuminator with 75mw IR diode designed to attach to the Tracker, Tracker 100, Pioneer, Pioneer 100, Sabre and Scimitar. Can also be hand held. 805nm output, variable beam and 3 power settings. 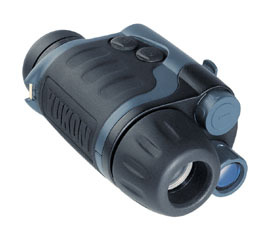 A superb, ergonomically designed hand held unit utilising the latest in GEN-1 Night Vision technology. Features built in infra red illumination allowing use in near or total darkness. Extremely robust in construction with a solid metal body designed to withstand shocks and protect the unit from water, dirt etc. Extremely easy to use, the unit is well balanced and fits snugly into the palm of your hand. The unit and independent infra red illuminator are operated via convenient thumb switches located near the eyepiece. A range of apertures on the lens allows you to adjust the brightness of illumination. Supplied in padded carrying case with shoulder strap.